Chrysostom liked to gloat that the apostles had gagged the tongues of the philosophers and stitched shut the mouths of the rhetoricians. The author of the tweet was a certain Catherine Nixey, who is an arts journalist for the Times of London. She has a book out claiming that the Christians deliberately destroyed almost all ancient literature, or some illiterate nonsense like that. I’m not sure who Patrick Walsh is, but he seems to post announcements of book launches. 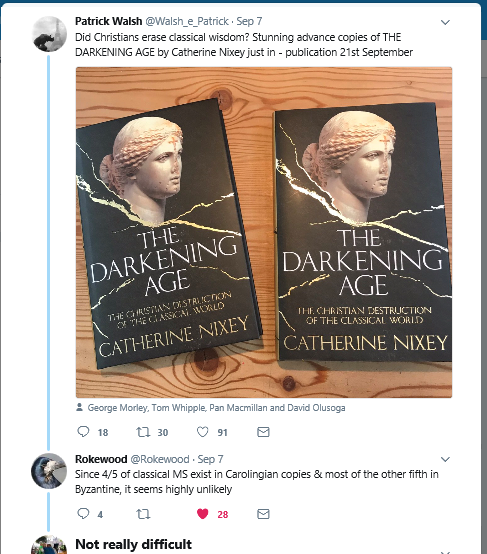 Anyway this one met with criticism, and @catherinenixey joined in in response. She then posted our tweet above. (The link to her tweet is here; but there is now no purpose in clicking that link, as we shall see.) I happened to see it; and responded. Screen grabs are below! Her response was to brush my results aside and demand I follow her so that she could talk to me by direct message. She did this a couple of times. And then… suddenly she deleted her account. This I discovered when I logged in, intending to write to her. Then I messaged George Morley, who seems to be her publisher, asking why her account had vanished. I saw no reply. So I can only infer that her publisher got windy about how things were going, and told her to stop tweeting fast. Rather than peering at those screen grabs, let me lay out what I saw. 11. Chrys. Jud. et gent. 5.3 (PG 48:820): φιλοσόφων ἐπιστομίζειν γλῶσσαν, ῤητόρων ἀποῤῥάπτειν στόματα. This is Chrysostom, Against the Jews and Pagans, a little known work. Certainly these words say what Nixey said – they gagged the tongues of the philosophers, they stitched shut the mouths of the rhetoricians. But that quote gives no context. What we need is an English translation. I learned from the bibliography at Fourth Century that one does exist, in Fathers of the Church 73, Chrysostom Apologist, p.210-11. So here is, not just six words, but the whole of chapter 5. It is not long. (2) It would not be by wielding weapons, nor by expenditure of money, nor by strength of body, nor by abundance of armies, nor by any other such means that the apostles would conquer the world. They would gain victory by a mere word, since that word had great power and was proved by signs and wonders. For they preached Christ crucified, they wrought miracles and. in this way, they conquered the world. It was on this account that David said: “The Lord shall give the word to them who preach the good tidings with great power,”‘ because this was his way of speaking of the miracles and wonders they worked. (3) And it was the result of an ineffable power that the fisherman, the publican, and the tent maker, at their mere commands, raised the dead to life, drove out demons, drove off death, stopped the tongues of philosophers, stitched shut the mouths of rhetoricians, overcame kings and rulers, and were victorious over barbarians, pagans, and every nation. (4) Indeed, David described the situation well in that way. For it was by that word which God gave them that they accomplished all those things they did. And it was with God’s great power that they brought the dead back to life, changed sinners into just men, restored sight to the blind, and drove out disease from the body and evil from the soul. And where did they get that power? That it came from the Holy Spirit is made quite clear from these words: “And they were filled with the Spirit,”’ and both men and women prophesied. Surely this is just a preacher, going through the events of Acts? Nothing more. How is this innocent retelling of the Acts, of the doings of Peter, Paul, and friends, a call for book-burning, fire and sword? What sort of person would read this like that? 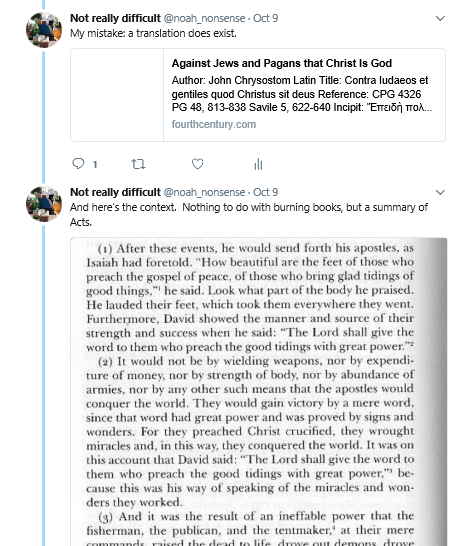 Anyway I posted the screen grab, and asked Catherine Nixey whether she felt that her “quote”, verbally accurate though it was, was a fair representation of what Chrysostom wrote. Her response was to delete her account. And that makes me feel rather guilty. I hope that I did not do her harm. One final thought. 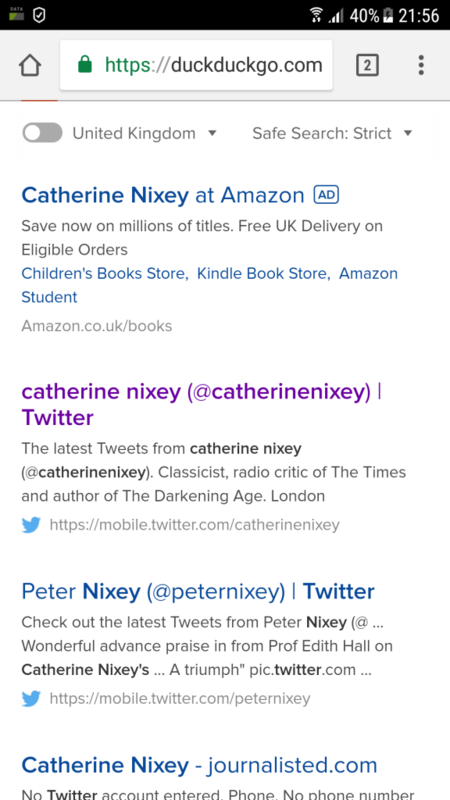 In view of the attempt to erase the discussion, probably by the publisher, here is a screen grab demonstrating that the @catherinenixey account did indeed exist. It’s not much; but I am unaccustomed to this kind of thing, so I did not capture her comments. 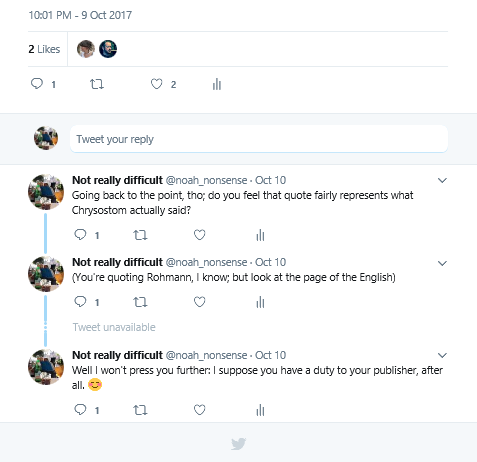 Does anyone know how to see deleted tweets? That passage – “stopped the tongues of philosophers, stitched shut the mouths of rhetoricians, overcame kings and rulers” – reminds me of Isaiah 52:15, though there do not seem to be any detailed Septuagint verbal echoes, but it seems like an elaboration of the imagery (I can even imagine – though this may merely reflect my poverty of reading – that he might have had Marcus Aurelius in mind, among others, though Acts 25-26 seem apt for something in the background, too). Just to get the record straight: probably Contra Iudaeos … is not authentic, but a later concoction from various sources. The metaphor that humble people (fishermen) were capable of surpassing the (so-called) “external science” (i.e. pagan) with all their schooling is so frequent in patristic texts, that the passage in question is almost irrelevant. @SeverJVoicu: Thank you. It seemed terribly familiar to me too. 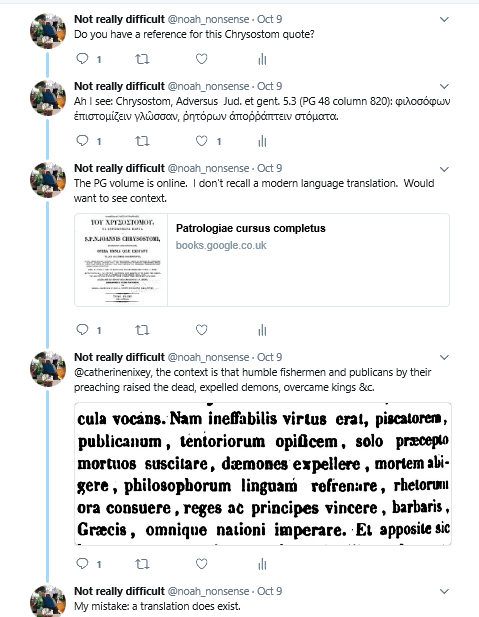 I wasn’t aware that the Contra Iudaeos et Gentes was probably yet another pseudo-Chrysostom text, so that is interesting to know. Thank you. Not surprised at all!